BRILLIANT BRITS EXPOSE THE DEBT SCAM! The following information is invaluable and in an honest world it would be made available to everyone. Sadly the financial parasites that wish to rule our world are dependent on keeping the scam going. Enjoy this wonderful lesson in economics. Here is the GetOutofDebtFree web site. Please share this emancipating information far and wide! Help put an end to debt slavery. The scientists say that while the science refutes the UN’s claim that man-made carbon emissions are to blame for global warming, they claim that the UN is pressing ahead with its sinister ‘climate regime’ agenda, which includes: destroying industrial civilization, propping up kleptocrats with Western tax funds, and seizing control of the global economy under the guise of regulating the immensely beneficial “gas of life,” also known as carbon dioxide. Dubbed “Day of Examining the Data,” the conference featured numerous presentations, each one debunking multiple elements of the increasingly discredited anthropogenic (man-made) global-warming theory (AGW). From explaining the myriad benefits of carbon dioxide to the environment and mankind to highlighting the ongoing 19-year pause in warming, no intellectually honest attendee could have left the summit still believing the “climate” hysteria pushed by various governments and international outfits. Indeed, practically every fear-mongering narrative pushed at the nearby UN climate summit was mercilessly debunked with facts, data, logic, and common sense. Later in the day, the film Climate Hustle brutally exposing the climate alarmism premiered at a nearby cinema in Paris, earning nothing but profuse praise from attendees. Among the scientists speaking at the realist summit were Dr. Robert Carter, former chief of the School of Earth Sciences at James Cook University. “Global warming is not happening,” he explained, even noting that long-term cooling was predicted. Carter’s presentation was especially fascinating because it totally shredded the outlandish notion that CO2 — exhaled by humans and critical to life — is “carbon pollution” in need of regulation. In fact, he said, even at current atmospheric concentrations, the Earth and the plants it supports are “starving” for more CO2. And in the past, CO2 concentrations were some 10 to 15 times higher. “Attempting to stop climate change is an exercise in utter futility,” he added, noting in an interview with The New American that nobody would seriously consider trying to “stop” earthquakes or volcanic eruptions. Every day I talk to knowledgeable patriots who nonetheless don’t quite grasp the diabolical nature of what has been done to them by international corporations acting under color of law and pretending to “represent” their states of the union. 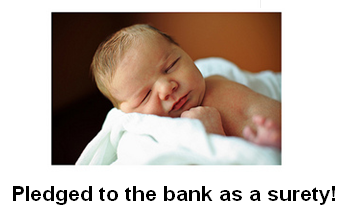 But within hours undeclared agents of the federal “State” franchise get our Mothers to sign Certificates of Live Birth. These documents are misrepresented as simple recordings of the baby’s birth. Instead, they are registrations of commercial “vessels” using the baby’s name, and serving to make the “State” franchise the beneficiary of the baby’s estate on the land. However many days, weeks, or months later as determined by “State” law, your “vessel in commerce” is reported “missing, presumed dead” to the probate court, which then doctors the civil records and converts your living estate to a trust ESTATE benefiting the perpetrators of this scheme. You are now officially “dead” with respect to the land jurisdiction and unless you take action to correct the probate court records, you and your assets are permanently trapped in the international jurisdiction of the sea. You are therefore unable to take recourse to your holdings on the land or the law forms of the land that you are owed. Ever heard the Constitution called the “Law of the Land”? This is why your constitutional guarantees don’t apply. There’s no version of “you” operating on the land as a result of this fraud.